According to legend, many centuries ago, Sicily was plagued with a drought and famine. The people prayed to St. Joseph and asked his intercession before the throne of God. Their prayers were answered. The clouds opened up and poured rain. With the ending of the drought and famine, a special feast of thanksgiving was held to honor St. Joseph. To show their gratitude, they prepared a table filled with food from the crops. The Feast of St. Joseph is celebrated annually on March 19. Volunteers prepare a three-tiered table filled with homemade Italian cookies, cannolis, pastries, artisan bread, baked goods, fish, pasta, wine flowers, and gifts for purchase. A special table is set for the Holy Family at the front of the display. 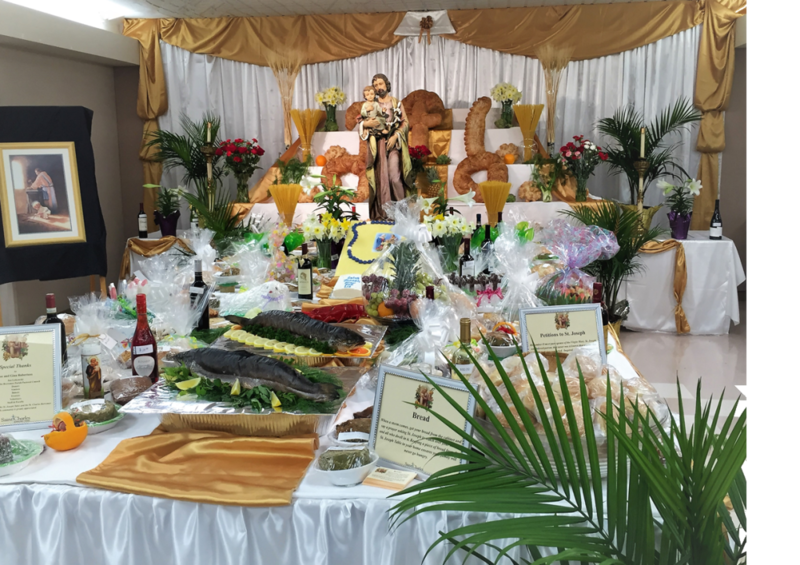 After the table is blessed, parishioners, school families, and members of the community are invited to view our St. Joseph Table and share a meal of Pasta Milanese, Pasta with Plain Sauce, Bread, Frozia, and a beverage. Our table is made possible each year with the support of community vendors, donors, and dedicated St. Charles Borromeo parishioners who volunteer their time and prepare all of the Italian cookies, cannolis and pastries. The meal is prepared by Mrs. Carmela Pollina and her family. Their dedication and continued support is greatly appreciated!